2017 North Trail King Slides, If you enjoy cooking outside, need sleeping space for 8, and are looking for a front private bedroom, you have found all that plus more in this dual entry North Trail King slide travel trailer 31BHDD by Heartland RV. Step inside the main entrance to your right and notice the sliding door into the front bedroom. There is a queen bed, nightstands and wardrobes on each side, plus overhead storage. To the left of the entry door you will find an angled countertop with a double kitchen sink, three burner range, overhead cabinets, and a refrigerator. A pantry for your non-perishables and a closet are along the interior wall. The road side slide out features a u-shaped dinette, and a sofa with overhead storage providing plenty of seating, a place to enjoy mealtime, storage, and more.Next to the refrigerator you will find an entertainment center with flat screen TV. There is storage both above and below the TV area and it can easily be viewed from any seating in the room. The rear right corner features a queen size set of bunks providing sleeping space for four. Opposite is a bath featuring a tub/shower, toilet and sink with overhead cabinet, plus a second entrance into the trailer for quick access to the bathroom. 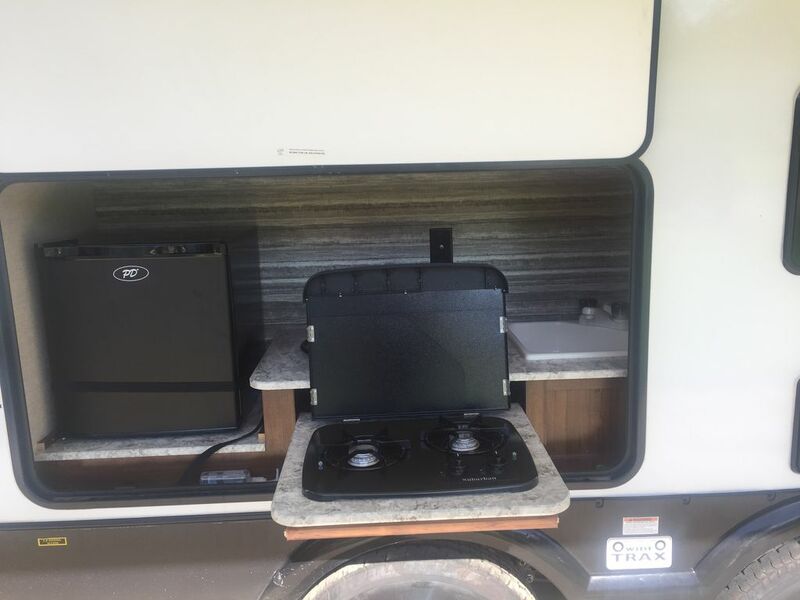 Outdoors enjoy cooking and dining with the convenience of an outside kitchen including slide cook-top with two burners, a sink, refrigerator, and so much more! Includes with rental; Keurig, toaster, pots, pans, with lids, silverware, cooking utensils, 4 coffee cups, 4 cups,, 3 set mixing bowels, dish drying rack, ice tray, butter dish, 1 set of linens and pillows for each bed (front queen, and 2 full size bunk beds), 6 sets of bath towels, shower curtain, floor mat, cleaning supplies, broom and dust pan. Large TV and DVD player, speakers inside and out. Includes weight distribution hitch (must have own brake control) Sewer hose, water house and 1 30 amp extension cord.